Then the meeting [of the Jewish leaders] broke up, and everybody went home. Jesus returned to the Mount of Olives, but early the next morning he was back again at the Temple. A crowd soon gathered, and he sat down and taught them. Note: The oldest and best Greek copies of John do not have verses 7:53-8:11. Nevertheless, they are in nearly all translations because the content is certainly consistent with Jesus' ministry. 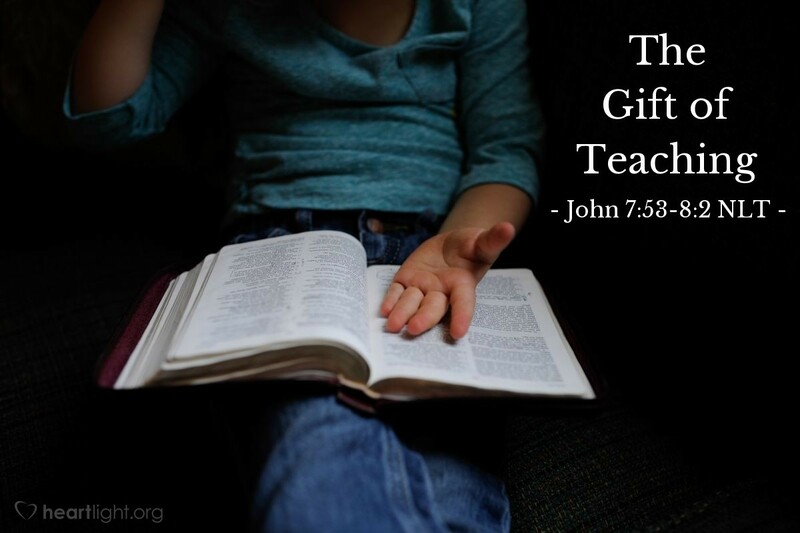 Jesus gave people the gift of his teaching. His words were God's word. He spoke and embodied God's message. So when people gathered together, Jesus gave them his great gift of teaching. In this instance, he taught them with his words, and he also taught them with his life, his actions. Let's never underestimate the importance of learning the truth from Jesus, through both his words and his deeds, and let's never underestimate the importance of our deeds' being consistent with our words. Almighty God and tender Shepherd, guide me into your truth. Conform me to the character of your Son Jesus. I especially ask for the help of your Holy Spirit to conform my lifestyle to the things that I believe to be true about Jesus. Help me to walk the talk and to put into practice the things I have learned. In Jesus' name. Amen.